“The mountains are like the bones of the earth. Water is its blood,” wrote a Vietnamese geographer in 1820. The country’s many rivers, large deltas, and long coastline have always played a key role in its agriculture, trade, and communications. The central significance of water, not only in the economy but in Vietnamese society, culture and politics, is one of the themes of my book, Việt Nam: A History from Earliest Times to the Present. The book demonstrates several perennial themes - ecological, linguistic, and genealogical - that permeate the millennia-long histories of the multi-ethnic lands that now comprise Việt Nam. First is the importance of the environment, landscape and climate, changing over time as heavy rains swept silt downstream and new sea levels transformed coastlines. Second is the history of languages spoken in the region. From the first millennium BCE, people in the north spoke Vietic languages, linguistic ancestors of Vietnamese. Inhabitants of the center and south spoke early forms of Cham and Khmer. And third, while many people migrated or switched languages, some of their genealogical heritage and cultural affinities persisted in family archives and ancestor cults. The identities of many Vietnamese are deeply rooted in the land where their forbears lie buried. Those moving south brought family cults from the north, while many Cham and Khmer maintained family names and some ancestral cultural practices even when they adopted Vietnamese. Yet change has matched continuity. Deep transformations, also charted in the book, have drastically altered Vietnamese history, from Chinese rule to French colonization. Vietnamese have adapted external religious, cultural, and political influences, from Buddhism, Confucianism, Catholicism, and communism, to human rights. Here, though, I will address the persistent significance of water in Vietnamese culture. In the early fifteenth century, during the war against the Ming dynasty’s annexation of the kingdom of Đại Việt, the Vietnamese leader Lê Lợi and his scholar-counselor Nguyễn Trãi deployed guerrilla warfare. In letters to the Ming commander, Nguyễn Trãi used a Việt water metaphor to assert that “scooping up a dipper of water will not empty the sea; pouring in a dipper of water will not overflow the ocean. Therefore, [those] who [know how to] use armies well are not pleased over a minor victory nor terrified of a major defeat.” Nguyễn Trãi apparently popularized a slogan that drew upon another Việt aquatic metaphor: “Like the ocean which supports a ship but can also overturn it, so the people can support the throne or sink it.” In Nghệ An, rebels challenged the Chinese: “Overturn the boat and then you will believe that the people are like water.” Lê Lợi’s army drove out the Chinese in 1428. Minh Mạng’s coronation coincided with a plague that reduced the population by 200,000. Yet one of his first acts was to ban the nôm script. Chinese became the sole language of administration. Confucian rigidity would disarm the country on the eve of Western colonial invasion. Water metaphors remained important in Vietnamese culture and governance through the twentieth century. Today, in an era of global warming, with droughts and upstream dams restricting the flow of water in the Mekong River, while sea levels rise and conflict simmers in the South China Sea, water is still the life blood of Việt Nam. 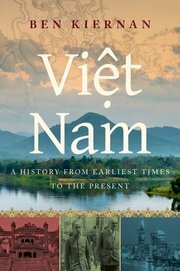 Details: Việt Nam: A History from Earliest Times to the Present is published by Oxford University Press, in hardback and eBook, priced in local currencies.